Technology Report will be live blogging SES San Francisco, one of the world’s oldest and arguably the top online marketing conference*. Most of that coverage will be here at Technology Report but I will also have posts at JoeDuck and our Retire USA Retirement Blog when the topics may be of interest to seniors and retired folks. Technology Report was actually started with my California Technnology buddy John Ghysels to cover SES plus other conference events in Silicon Valley like the Mashup Camp and Startup Camps (I miss those!) but I have not been to SES for several years and I’m looking forward to reporting from there this year and giving extra attention to the topic of Search Engine Optimization or ‘SEO’, something always near and dear to me as somebody who supervises so many websites. Social media has shaken things up quite a bit both online and in the SEO field. In my view Google has become much more conservative ranking websites. Google now assumes very correctly that most new websites are spam or very low quality sites, and therefore Google looks for “big signals” to allow new sites to rank well for valuable terms. This adds yet another burden to new websites that deserve to rank well, especially those that seek valuable niche markets. SEO 2012: What Still Works? SES Conference first timers will want to note that this conference is fast and furious, and you can’t possible take in everything over the course of three days. I’d recommend you review the materials carefully before the show and pick a few topics and speakers you’ll want to hear and be sure to get to those talks. Ask a question or introduce yourself to the speakers afterwards. (tip – you’ll certainly want to have Google’s Avinash Kaushik on that list). SES Parties: Sadly, the incredible “Google Dance” is no longer a feature of the SES conference but you’ll want to keep your eyes open for party opportunities with the many exhibitors at the Conference. The burst of the dot com bubble meant downsizing of both internet companies and their parties, the best of which was the amazing “Google Dance” held at the close of SES on the Google campus in Mountain View. * There are basically three major online strategy conferences and the history of these events is quite fun and interesting. 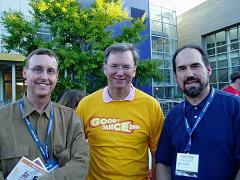 They are SES, SMX, and PubCon.